Brandeis’ Information and Technology Services is in the middle of a multiyear transitional project that will change the University’s administrative software from PeopleSoft to Workday. Currently, ITS is in the process of implementing Workday for the University’s human resources, payroll and finance operations. This first phase, named Phase One, of the implementation is scheduled to launch on April 1, 2019. In preparation, ITS is actively working with representatives from different departments to ensure the software will suit the University’s needs. The lessons that ITS learns during Phase One will be applied to Phase Two, which deals with student programs like SAGE and which is currently in the early planning stages. PeopleSoft and Workday are Enterprise Resource Planning softwares. ERP software takes “all of the various processes that are essential to running a business” and “integrates these various functions into one complete system to streamline processes and information,” per the Oracle Netsuite website. Phase One of the Workday implementation focuses on processes involved in human resources and finance operations, while Phase Two will deal with student processes, such as registering for classes, Jim La Creta, the University’s chief information officer, explained in an interview with the Justice. La Creta cited the payment of employees, hiring of new staff and running financial reports for different departments as examples of the University’s HR and financial processes. PeopleSoft became the University’s ERP software in 2002, and since then, different departments on campus have customized the software so that it suits their needs. La Creta explained that these departments each need to run specific reports to get different sets of information, such as their department’s budgets, hiring processes and tax forms. The University first identified its need for a new ERP software back in 2011 and 2012, but little progress was made, La Creta explained. When he joined the project in 2016, it was clear that “[the University] needed to address this immediately,” he said, and the University started looking at its options for a new software. In spring 2017, ITS looked at different vendors, and it eventually selected Workday as the ideal software for the University. At the time, “about 200 institutions,” including other colleges in the Boston area, were using Workday for HR and Finance, according to La Creta. “[Workday] will be light-years better than what we currently have,” La Creta said. Workday will eliminate the paper time sheets currently used by employees to log the hours they work. Employees will now be able to log hours online and through the Workday mobile app. This will save “approximately 160,000 sheets of paper per year,” according to the Workday website. However, implementing Workday is not a simple process. La Creta compared this project to the construction of Skyline Residence Hall. He highlighted the fact that only a portion of campus goes into that building regularly, and there will be people on campus who never enter the building. The University began the implementation process in September 2017 and has since been conducting various rounds of testing in order to ensure that departments’ needs are addressed, according to La Creta. A group of over 60 people from ITS, Financial Affairs & Treasury Services, the Office of Planning and Institutional Research, the Office of Human Resources, the Division of Students and Enrollment and other departments are working on this transition. Right now, ITS is testing the HR and finance functions of Workday, Nash explained. To do this, representatives from Finance, HR, ITS and external implementation partners gather in a conference room and go through “the whole process around hiring someone, or doing a payroll, or reevaluating benefits — all the different functions that HR and Finance has to do all the time,” Nash said. Another important aspect of the work ITS is doing right now to smooth the transition is trying to identify “nooks on campus” where departments are using PeopleSoft for processes that ITS is not aware of — and thus, cannot plan for in the transition, La Creta explained. To this end, ITS has had liaison groups conduct “road shows” to talk with different parts of campus about Workday and to gather their questions and concerns. They are also “talking to different parts of the University and understanding how they do their pieces of business and what they need to be able to do in a new system,” he said. In implementing Workday, ITS is gathering a lot of information on how different departments use the software, which La Creta hopes will help streamline some processes. If ITS knows that different departments run similar reports, they can build a report that satisfies the needs of multiple groups at once. This will help to make the system “more lean” — and avoid the customization problem the PeopleSoft currently labors under. Looking toward Phase Two, which will deal with student operations, La Creta said, “One of the lessons learned from HR and Finance is that we need to have a very long planning period.” ITS is still in the initial planning process of the student implementation, which will affect programs like SAGE and processes like registering for classes. It is too early in the process to predict whether other student-related systems, like LATTE, which gets data from PeopleSoft currently, will also experience changes, La Creta explained. ITS has formed a subcommittee to start to plan the implementation, including representatives from the Registrar’s Office, the Office of the Provost, Admissions and other student-related groups, according to Nash and La Creta. The April 1 Phase One Workday transition will only impact student employees. Brandeis University Self-Service, the website where students can view their paychecks and tax documents, will change as Workday systems take over those processes. Additionally, all staff, faculty and student employees will have to use Duo two-factor identification login by April 1, as it is required by Workday. 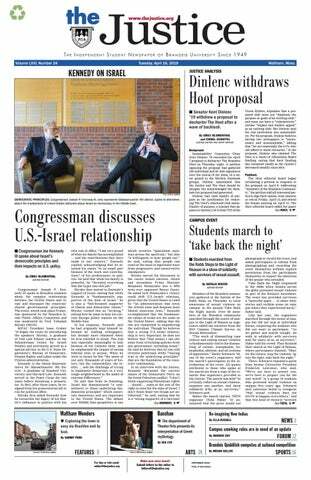 Members of the Brandeis community can email workday@brandeis.edu with questions about the implementation. There will be a Workday User Forum on Dec. 3 for the community.